These days, more than ever before, families as well as individuals are looking for more and more creative ways to save money and share expenses. One way to slash that grocery bill is to get together with other families and combine your food shopping lists in an effort to cut back on spending and save your hard earned dollars in order to get by during these tough economic times. And young adults are no exception; they, too, are looking for ways to share expenses. University students and young adults just starting out are jumping on board the saving wagon as well. While it may seem odd at first, there are definite benefits to sharing your shopping list. 1. 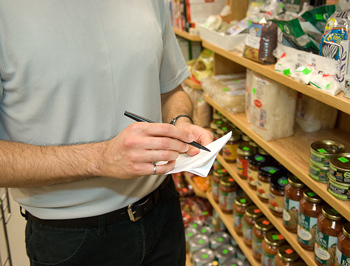 Buying in bulk – buying in bulk can seem like a costly endeavor from the outset; however, once you get the hang of price checking, you will be able to spot a bargain from three aisles away. 2. Learn how to compare prices – learning how much something costs is the first step to saving. Go to your local supermarket and spend about an hour looking at the price per kilo for certain items that you frequently buy. Thereafter, take some time during your lunch hour to browse through the assortment of supermarket and grocery flyers that come to your home or apartment. Keep a journal of how much on average your favourite staples cost (like a mini price book). Once you have learned how much your top ten items cost and the cheapest price that you can buy them for, you will be well on your way to being a top-notch bulk buyer. 3. Bring your calculator - the first couple of times you visit a bulk store, bring your calculator. Open up your notebook and compare the unit price of one item to the bulk price of several. For example, if you buy a six-pack of your favourite brand yoghurt for $4.00 and a twelve-pack in bulk costs $6.00 on sale, just double the price of the six-pack if bought individually and note the difference. If you were to buy that six-pack twice, it would cost you $8.00. However, if you were to buy a twelve-pack once on sale, it would only cost you $6.00. Your savings would be $2.00. If you split the pack and the cost with a friend, you will now only pay $3.00 for your six-pack of yoghurt. If you can save a dollar on yoghurt, imagine the savings on big-ticket items like toiletries and meats. It really does add up quite significantly. There are so many ways to save if you just put a little time and little bit of effort into the mix and sharing your shopping list is one of the best ways to begin your saving endeavours.